Maybe you have experienced the following situation in Windows in the past; You try to delete a file in Windows Explorer but get a message that it cannot be deleted. Common messages include "Cannot delete file: Access is denied", "The file is in use by another program or user" and " Cannot delete file: It is being used by another person or program". For some files, the situation is easy to resolve. A video file for instance that is still playing in a video player cannot be deleted before the player is closed. It happens sometimes that files are locked by Windows even if you cannot find another program or person that's accessing them at the moment. Tools like IOBit Unlocker, or the most popular "cannot delete" files" tool Unlocker, can usually resolve the situation. They unlock the file so that it can be removed from the system after all. IOBit Unlocker has been released as a free beta version. The program adds an entry to the Windows Explorer context menu during installation that can be used to send file information to the unlocker. Files can also be added via drag and drop directly. The program window displays the selected files and folders in the upper half of the program window. Each item is listed with its name and status that indicates whether it is currently locked or unlocked. The processes that use the file are listed in the lower half along with their file name, path and process ID. 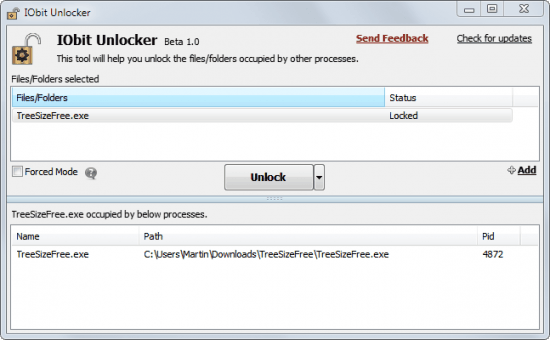 IOBit Unlocker offers two unlocking modes. The first is activated with a click on the Unlock button. The program tries to unlock the selected files. The small arrow next to the button contains options to perform a second operation, like delete or copy after the items have been unlocked. The forced mode checkbox has been added if the standard file unlocking fails. All processes that lock selected files will be terminated if the option is selected. How sophisticated is the beta version of IOBit Unlocker? It lacks some of the features of Unlocker, for instance the ability to delete files on the next system restart if they cannot be unlocked in the current session. For now, it is a solid alternative that lacks features. It will be interesting to see if the developers add the missing features in the final release of the application. I learned about Unlocker on this site. And that’s one essential tool I always have handy. I used Unlocker for a long time and switched to EMCO UnlockIt which was a bit slower but I ended up making no use of their extra feature set. So I was very happy when I saw this, I’m a big fan of IOBIT, especially their ToolBox but this app shouldn’t even be in public beta yet. On Win7 x64 is slowed my context menu down to molasses taking well over a second to open when right-clicking on any file. After what happened with MalwareBytes and (desite what IOBit says) the fact they detected patterns that Iobit stole their code, I can not bring myself in any way to even think of trying Iobit’s software. I’ve always used FileASSASSIN tool which is part of Malwarebytes and it works great for getting rid of locked files created by adware or rootkits. Also after reading the article that Xmetalfanx provided, I will side with him/her and won’t be trying this one out. I am Highly satisfied with Unlocker version 1.9.1 running on Windows 7 (64-bit) and will be sticking with same as I no longer trust the IObit company after reading about its controversy with one of my favorite anti-malware applications, Malwarebytes! Nice share. I use also an alternative “LongPathTool” a guaranteed fix for error problem. now you have to use long path tool to solve this type of problem.